CReSIS Signal and Data Processing Group 2018 (missing Jilu Li and Manjish Adhikari). The Center for Remote Sensing of Ice Sheets (CReSIS) Signal and Data Processing Group focuses on research for new processing algorithms as well as designing, developing, and operating processing pipelines for radar data collected by the research center. We have an opening for a graduate research assistant in signal and image processing starting in fall 2018 (through fall 2022 at least). If you are interested in graduate work in the areas of array, radar, or image processing, please let us know. My research focuses on HF to Ka-band signal/data processing and radar system engineering for remote sensing of terrestrial snow and ice (non-atmospheric). Direction of arrival estimation applied to SAR (SAR tomography) and optimization, machine learning and image processing applied to radar imaging are my current areas of interest in this field. CReSIS Signal and Data Processing Group 2017. EE MS 2018: Hardware Development Engineer at Optimum Semiconductor Technologies Inc.
CReSIS Radar Data Processing Pipeline: We have collected about 1 PB of data as of 2016 and are adding about 100 TB per year. There are four radar sensors, each configurable and being updated periodically. The code is primarily written in Matlab and C. The pipeline is driven by parameter spreadsheets that allow large batches of jobs to be scheduled in a single shot. We use a custom Torque Scheduler interface on three clusters (128 core, 1840 core, and remote-field-configurable cluster 32-96 core) for most of the processing. The system includes support for stepped-chirped, deramp on receive, and regular directly sampled radars. The pipeline includes GPS alignment, metadata tracking, pulse compression, deconvolution, RFI suppression, SAR processing, and space-time array processing. Field work and data processing for NSF-NERC projects Thwaites MELT and GHOST and NASA Operation IceBridge Multichannel Coherent Radar Depth Sounder (MCoRDS), Snow Radar, Ku-band Altimeter, and Accumulation Radar on a variety of aircraft including CReSIS built UAVs as well as some ground based radar work. SAR Active Target and Multistatic Receiver for ultra wideband radar system: to be used for array and radiometric calibration and as portable radar system. Interested in hiring student with strong Verilog and C++ experience. We have three projects, SPIDAL, Operation IceBridge, and Stability and Dynamics of Antarctic Marine Outlet Glaciers, working on 3D imaging. SPIDAL REU 2018: Anjali Pare Abstract on tuning hyperparameters for Levelset algorithm. Also worked on 2D layer viewing. Poster presentation is being prepared for April 2019 Kansas University Research Symposium. 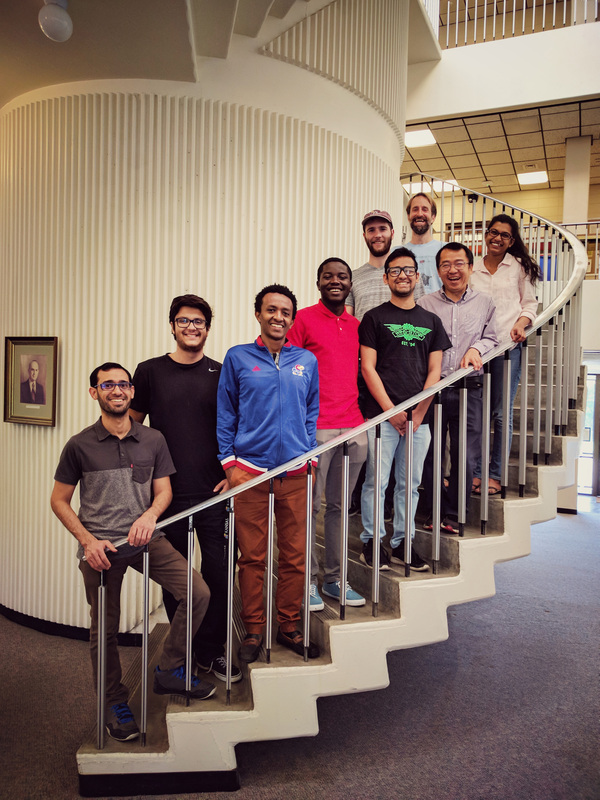 SPIDAL REU 2019: TBD on integration of CReSIS processing pipeline with Indiana University's TWISTER2 HPC development environment. This is a project to develop a 2-18 GHz FMCW radar for the NASA Global Hawk UAVs. The first planned deployment is on the NASA P-3 during the Spring 2017 OIB campaign. Actively working on the Open Polar Server which is an open source system for storing sounding radar data that is hosted on Github. We are working on this as part of SPIDAL. We are collaborating with several external groups on this work. We are working on a proposal to continue previous work on this.